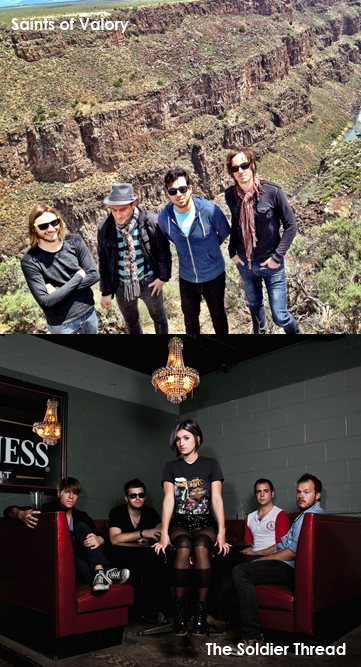 An Austin double-header in Charlotte on August 15 might just leave you with two new favorite bands: Saints of Valory and The Soldier Thread. August is shaping up to be a pretty fabulous concert month in Charlotte, kids. Just announced yesterday, a hot, hot, hot Austin pairing will hit the Queen City on August 15th at Tremont Music Hall: Saints of Valory & The Soldier Thread. Local kids S.O. Stereo will share the stage, as well. If you somehow have missed it, Saints of Valory has SKYROCKETED to the very top of my “favorite artists EVER list” over the last 18 months. This talented quad of fellas has won my musical ear with their spirited, ardent rock – and they put so much heart into their live performance, it just sent me tumbling head over heels for them. The guys are earning fans around the country – they have recently shared the stage with Michael Franti & Spearhead and were the Southwest region finalist for Billboard Music’s Battle of the Bands. Tack on The Soldier Thread, an on-the-brink rock act with heavy doses of pop and electronica fronted by the golden-voiced of Patricia Lynn, and you’ve got a recipe for an absolutely KILLER show. So, mark your calendars, kids. Wednesday, August 15th. Doors at 7:00, first band goes on at 8. Tickets are $8 at the door – $3 surcharge for under 21. More info here. This entry was posted in Live Shows, Music and tagged charlotte bands, charlotte concerts, charlotte live music, Kids EP, Matador, music to see in charlotte, Saints of valory, the bull ep, The Soldier Thread, tremont music hall by Krissie. Bookmark the permalink.